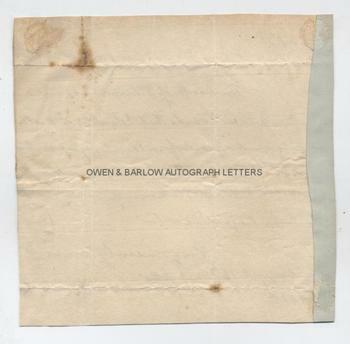 SIR JOHN DUCKWORTH AUTOGRAPH Letter Signed. British "age of sail" admiral who served in the American War of Independence and the Napoleonic Wars. ALS mentioning Admiral Lord Nelson's doctor. 1p. [Place undeciphered]. August 16th, 1805. To "Dear Sir." 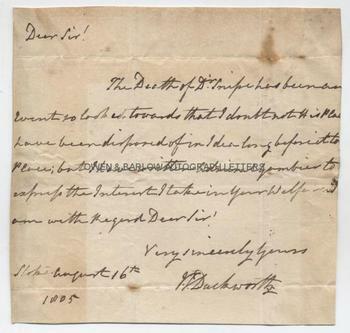 "The death of Dr. Snipe has been an event so looked towards that I doubt not his plac[es] have been disposed of in idea long before it to[ok] place; but I have written Admiral Gambier to express the interest I take in your welfare and am with regard Dear Sir, Very sincerely yours"
On paper watermarked 1802 and measuring approx 7 x 7 inches. The letter has been trimmed at margins with slight losses to the last letter of two or three words at right edge and has probably been trimmed at head and tail but without loss to the text of the letter. Somewhat dust stained and age toned and with a rust or foxing spot (not touching text). There is a strip of old album leaf adhering to right edge of verso and mounting traces to corners. All else VG. Admiral Sir John Duckworth commanded at the Battle of San Domingo in 1806, the last great fleet action of the Napoleonic Wars. From 1803 to 1805 John Duckworth was Commander of the Jamaica Station and had been appointed Vice-Admiral of the Blue in 1804. Dr. Snipe, refered to in the letter, was physician to the Mediterranean Fleet and Nelson's doctor. There is an interesting account of him taking offence when Nelson refused to take a dose of physic when the French fleet was out and Nelson was somewhat anxious. "Poo! Dem it" said his Lordship, "What do I care for my health at present". But the lofty admiral was required to feign a slight fever and accept medication just to get back on speaking terms with his friend. Snipe fell ill with consumption and was sent home to England, where he died in August 1805. Clearly, there was some competition for his place as fleet physician and John Duckworth seems to be assuring his correspondent that he will do what he can but thinks the vacancy has already been filled. Admiral James Gambier had just returned from command of the Newfoundland Station and had been appointed a Lord of the Admiralty in 1805, presumably with power to make the appointment of Snipe's replacement. Two months after the date of this letter the Battle of Trafalgar took place. John Duckworth was ordered to find Nelson and join the battle but instead went in persuit of French ships whilst blockading Cadiz, something that he was subsequently criticised for.